Abbasov Mehdi was born in 1960, January 1st in Yeniyol village of present day Amasiya (former Aghbaba) region of Western Azerbaijan. He went to school in Yeniyolvilliage in 1966 and finished the same school in 1976. Under an unbearable pressure of Armenian dashnak party, Mehdi and his family were forced to leave their home town and lands in 1977. Mehdi, then along with his family moved to Kulanvilliage of Tulkubash region of Kazakhstan Republic. He worked as a tractorist in a state farm (sovkhox) named after Kuybishev in 1977 – 1978 in the same villiage. Mehdi applied for the Preparatory Department of Chimkend Pedagogical Institute in 1980. After studying there for a year, he entered Karaganda Pedagogical Institute. And he started working as a teacher at school named after Gagarin in Michurinvilliage of Tulkubash region after obtaining degree on pre-military training and physical education in 1985. The very same year he, fulfilled sports rate in Classical Wrestling and earned the name of “Master of Sports of USSR”. A short while later, Mehdi decided to change his profession. In November 1989, by the decision of the District Committee of the Communist Party in Tulkubash region of Kazakhstan, he was sent to work for MIA (Ministry of Internal Affairs). He became a student of Higher Courses of Ministry of Internal Affairs of USSR in Stavropol between 1989 – 1990. Later on, he continued to serve as a police officer in Enbeysh in RD. Mehdi hurried to help his compatriots when dark clouds started filling the skies of Azerbaijan. Though he got accustomed to living in Kazakhstan where he spent over 15 years of his life and obtained his major also there, this country started seeming to him like a cage. When he was studying in Stavropol, he was on practice in Yessentuki and he met the vice minister of Internal Affairs of Azerbaijan – RamizMammadov there. The vice minister, in his turn, when seeing that Mehdi loves his country and he is a caring patriot, invited him to serve for his own country – Azerbaijan. But in the Department of Internal Affairs of Enbeysh region of Chimkend province, they did not want to let Mehdi leave his post. Finally, after a long correspondence, Mehdi was sent to serve for the Ministry of Internal Affairs in Azerbaijan. One month later, with the rank Lieutenant - he started working as a captain for MIA of Azerbaijan in the Department of XTMD. From the first days he wanted to be in the combat zones and to take active part in the battles. And it was impossible to make him change his mind. He joined the battles that were taking places in Azerbaijani regions such as; Aghdam, Goranboy, Fuzuli, and was taking an active part in all the combat operations and was smashing in the battlefields all Armenian armed forces. In September 1991, he was returning in a helicopter from another operation in Goranboy region. Armenians started firing at them heavily. Therefore the pilot had to land the helicopter in the area surrounded by the enemy. It was extremely dangerous but Mehdi managed to take the team to a safe place by destroying a lot of enemy forces. His nickname was “Mixaylo” and he was awarded a medal for the bravery from MIA four times. His last battle took place in 1992, January 13th. There were heavy battles taking places around Melikcan post. As always, Mehdi was fighting in the front lines. In this battle for life and death, Mehdi was severely wounded in his head by a sniper bullet. Despite of it being very difficult, his battle friend managed to take him to a safe place. It was too late though. The bullet had already done its job. On that day, he closed his eyes forever. 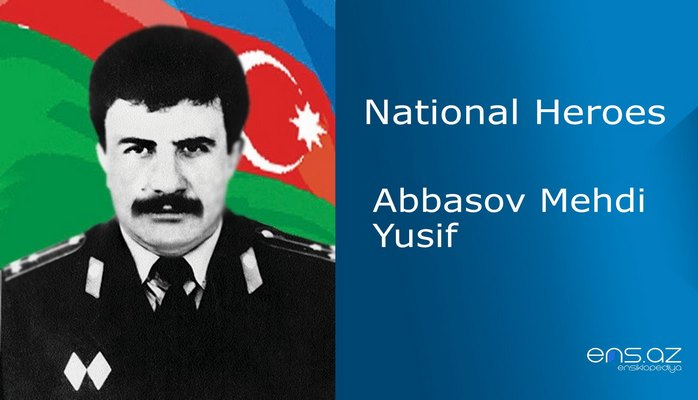 Lieutenant Abbasov Mehdi Yusif was posthumously awarded the title of "National Hero of Azerbaijan" by Decree No. #831, by the President of Azerbaijan. He was buried in the Alley of Martyrs in Baku. To honour our brave soldier a village which was formerly called Rushan in Ismayilli region is now named after Abbasov Mehdi - Mehdikend. One of the main streets of Ismayilli region also carries his name.